Filming took place several days a month between July 2012 and January 2013. 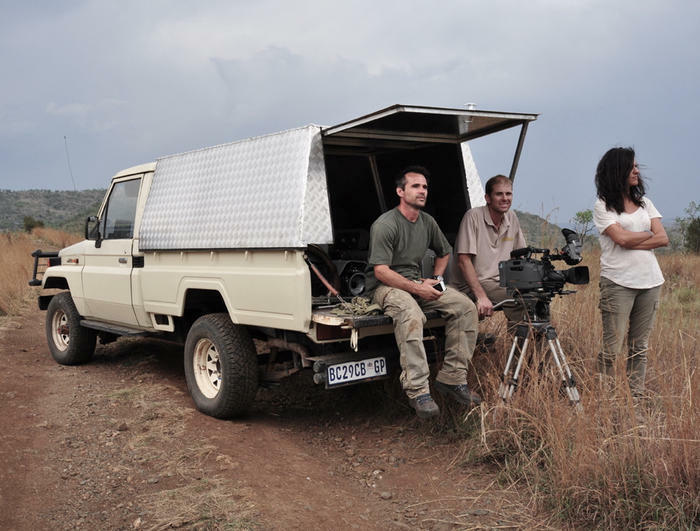 The crew consists of Presenter/Producer Kevin Richardson, Cameraman Riaan Venter, Director Virginia Quinn and Camera Assistant Vanessa Venter. 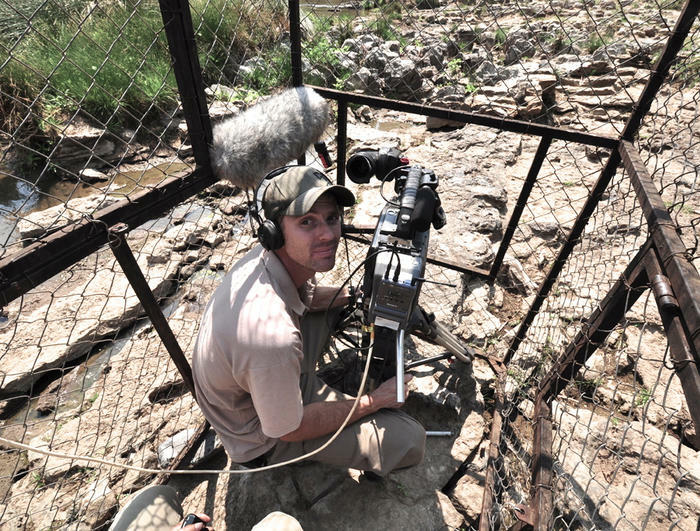 While Kevin stays and interacts with the lions and hyenas, the rest of us spend most of our days in a cramped predator proof metal cage with filming hatches on every side. 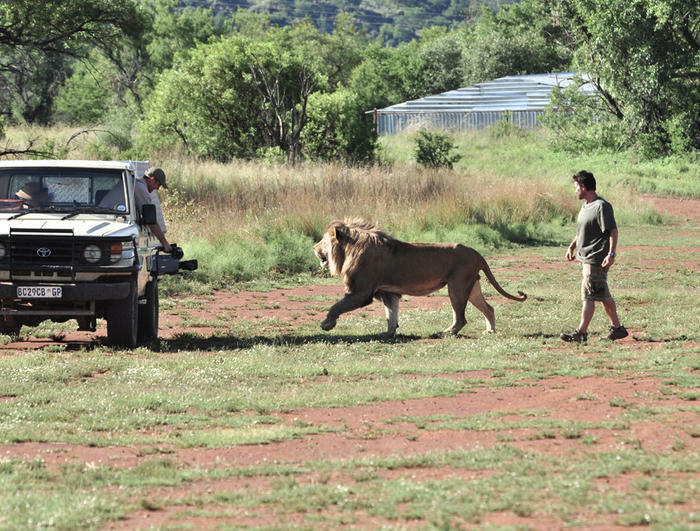 This allows us to stay safe and still get within inches of the animals depending on their behaviour. 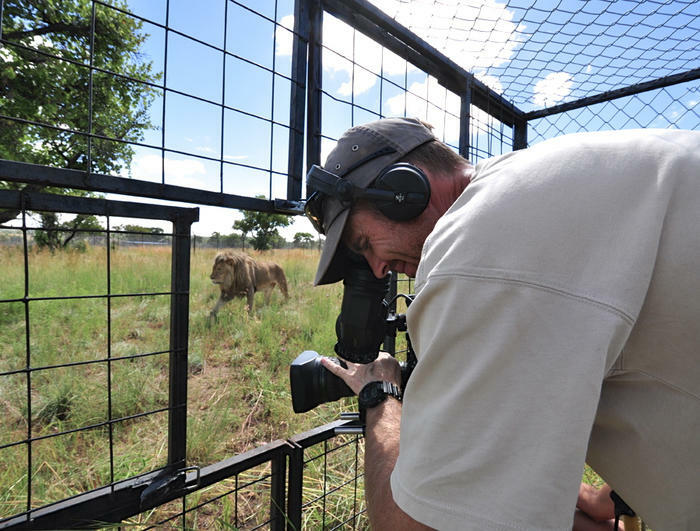 The cage is portable and allows us to get very close up observational footage of the lions and hyenas interacting with Kevin or just going about their daily lives. 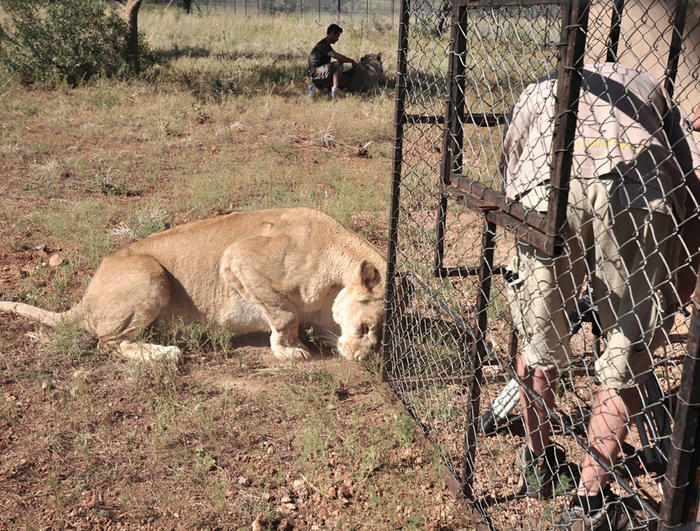 Most of the animals are habituated to the cage, although there are exceptions… Some of the lions find the idea of caged humans (and monitor leads and tripods) rather intriguing and actually spend their time trying to find ways to break in; either dig us out or undo the latches! It’s really important not to shout or get excited when they start doing this as it then turns into a game… Suddenly humans become even more interesting. However, there are times when you really need to take a deep breath as you are reminded by just how powerful they are when you feel like prey trapped in a cage and they are standing on their hind legs! Also, unlike Kevin, we do not have relationships with the animals and would never be able to interact with them. Most of the time they eventually lose interest in the cage and get bored, but there are a couple of characters that don’t. And this is when we have to stop filming. We also found out that when the lions scent mark their territory with urine, it can include the cage and human contents too! 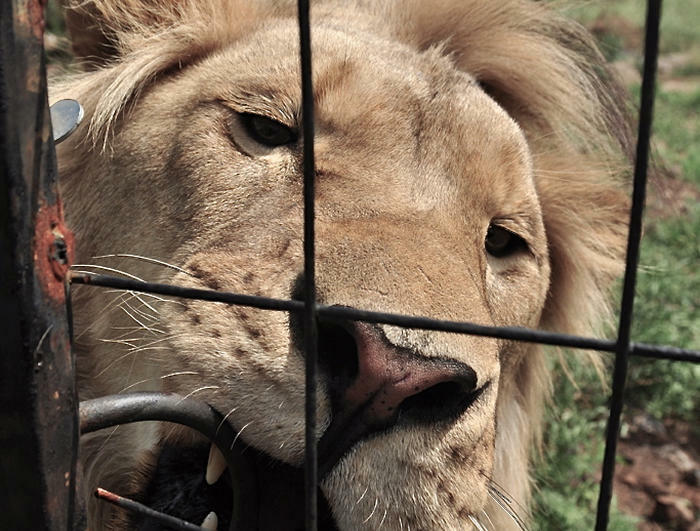 Another challenge is that so often we set out to film certain scenes, but the lions have other ideas and we end up filming something entirely different. But sometimes this is a happy co-incidence and we get really fresh or unexpected material. The animals like us have different moods and characters, something that Kevin is adept at reading. This can help us decide what and when to film. As Kevin has such a close relationship with the animals he is also able to operate the cameras to create shots with a very different feel. Being able to move freely among the lions and hyenas provides very immersive angles that a normal camera crew would find impossible to do. 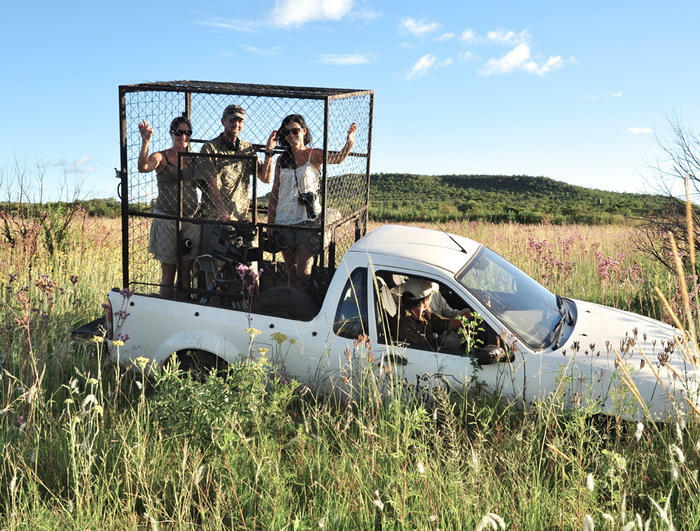 On the days when we moved the lions and hyenas we used a second camera crew to cover all the action. The days were hot and long and we couldn’t risk holding up the animals or risking their well being. Small go–pro cameras in the moving vehicles enable us to capture the entire loading process and the journey itself. Although as we soon found out despite our very best efforts at disguising the equipment in the roof of the van, one of the hyenas soon made light work of one of our cameras, an interesting angle straight into the powerful jaws of a hyena! Read more about this documentary and watch the trailer for this production here.